The Blade doesn't have the top end spec of some touchscreen handsets, but this isn't where Samsung is pitching this device – it has others in the range for that market. Sharp-looking or cutting edge? The Samsung Blade GT-S5600V sits in the ever-expanding Samsung touchscreen mobile range somewhere above the Tocco Lite and below the super-charged Samsung Jet. A Vodafone-tailored version of the Samsung GT-S5600 Preston, it has most of the feature run down of the budget-priced Tocco Lite but expands its capabilities with additional 3G HSDPA connectivity. Design-wise, the Blade takes its cues from the Jet line, sporting similarly curvy bodywork and eye-catching angular front buttons. It has that now-familiar minimalist black bodywork that tips its hat to Apple's trend-defining iPhone. The Samsung Blade does, however, have a smaller display than its stable mates – a 2.8-inch 16-million colour QVGA (240 x 320 pixels) array that's fractionally wider, but shorter than the Tocco Lite's 3-inch screen and the Jet's 3.1-inch rich AMOLED display. The Blade works on Samsung's TouchWiz touchscreen user interface, with support for home screen widgets, and has almost the same operational set-up as the Tocco Lite. Within its touch-operated applications are similar features too, including music and video player functionality, an FM radio and Google Maps, plus a 3.2-megapixel camera – this time with an LED flash. Although it does offer HSDPA high-speed data at up to 7.2Mbps data rates, it doesn't have the Wi-Fi capability of the Jet, reflecting the Blade's more modest price tag. 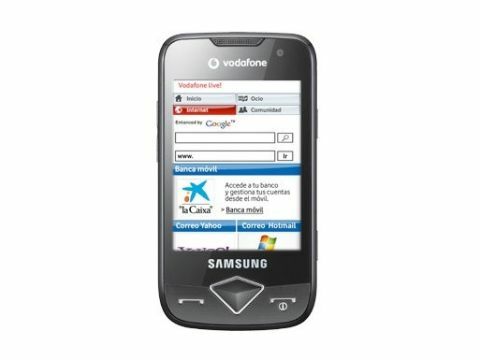 The Samsung Blade GT-S5600V is initially available free on Vodafone contract deals, and is available in its non-Vodafone S5600 guise for free on Orange contract deals or for around £120 in pay as you go packages.